This year, send holiday greetings from your heart. Our holiday cards are 8.5" x 5.5" printed in color on high quality cardstock. Included are envelopes and plenty of space inside to express yourself. Why not tell your friends and family how important our best friends are to you! 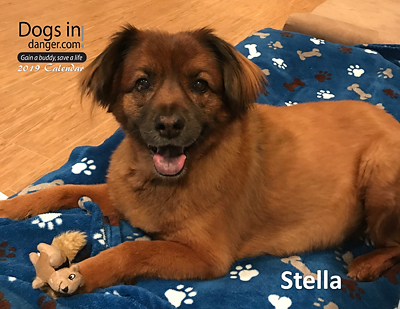 Get the calendar that will warm your heart all year long! Each month features pictures of furry best friends, many who are alive today because of DogsInDanger. Want to help us help the dogs? Make a one time donation quickly! This is an easy way for you to support our mission to end the killing of dogs. Enter any amount in the payment box, click the "Donate Now" button, you will become a Friend of Buddy! With great thanks and appreciation from us, and the dogs. Recurring monthly gifts provide a consistent, reliable income that allows us to spend less time fundraising and more time saving lives. It's an easy, efficient and tax-deductible way to help stop the killing. With this method you continue to help our efforts with a recurring monthly donation. You select the amount and the number of months, we will debit your credit card monthly and send you a notice each time. This level of giving makes you a member of the Buddy Club, an inside circle of supporters whose loyalty to our mission runs deep. HELP THE DOGSINDANGER RADIO HOUR SPREAD THE TRUTH! Every Sunday 1-2PM EST in New York a new breeze will be flowing through the air! A fresh breeze of truth and honesty in the discussion of pet critical issues. Help us propel this breeze right accross this great nation. The DogsInDanger Radio Hour airs on WNYM 970AM, The Apple every Sunday. It will also be simulcast on DogsInDanger.com extending the show to a worldwide audience. The talk show will bring together key personalities from all aspects of the animal movement to discuss and air issues relevant to all pet lovers. Please help us defray some of the production costs through your tax deductible donation, help us spread the word far and wide. The 21st century is one of total communication and we need you on the side of honesty and truth. We want more dogs saved from death and we want everyone to know how! We just produced an incredible PSA (public service announcement) with a professional film crew! Now we need your help so we can buy the necessary airtime. An award winning New York team has donated their creative talent and we have funded the balance of the production effort. The PSA is right now in editing and we expect it to be finished in the next month. Then we need to buy advertising time on the networks so we can air the PSA. Please help us by donating funds to our Network fund! You can make a memorial donation in the name of a beloved animal or human. With this donation, you make a lasting tribute to someone special while helping us with our mission. Enter any amount in the payment box, click the "Make a Gift" button. Email address of the bereaved family if you would like an acknowledgement sent. We will not include the dollar amount of the donation. 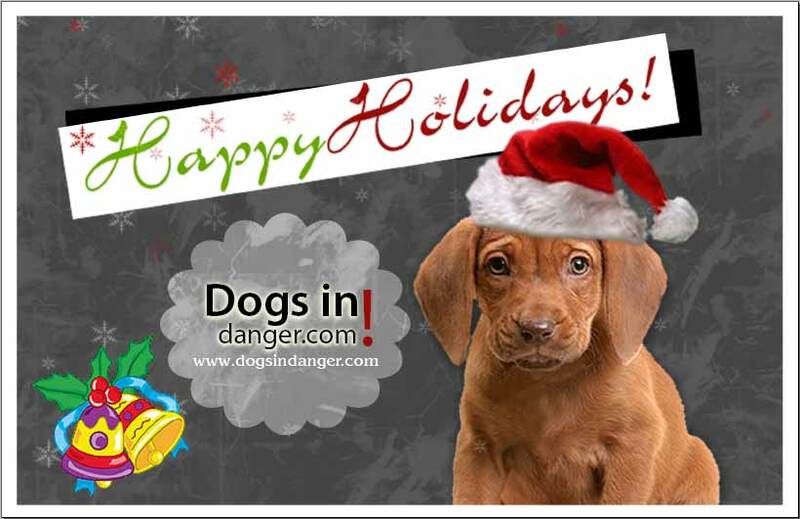 Honor someone special in your life with a donation to support DogsInDanger. Perfect for holidays, birthdays, bar mitzvahs or any special occasion! 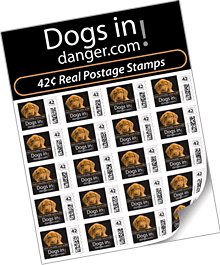 Buy genuine $0.49 US postage stamps with the DogsInDanger logo imprinted. 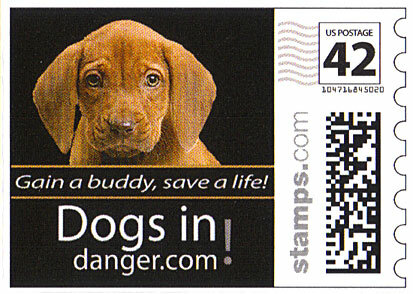 What a cool way to take care of your mailing needs, help us raise funds and pass the "animal" message on to the far corners of the world.Our apologies, stamp image shows 42¢ but our actual stamps are in the current 1st class mail amount of 49¢. Each sheet contains 20 stamps and costs just $44.00! Minimum order is one sheet. Each mousepad is just $28.99! Yes snail mail is still alive and well! Have guests remember your wedding with a meaningful gesture that will last a lifetime. Getting married? Considering a donation to DogsInDanger in lieu of wedding favors. 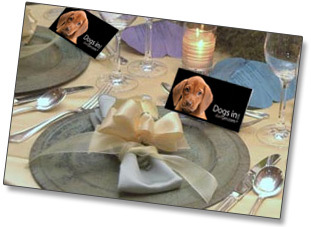 In exchange for your thoughtfulness, we will provide you with place cards to notify your guests of your kind gesture to help homeless dogs. The most gratifying gift to to receive at your wedding is the gift of life. Instead of beginning a new collection of dishes, begin your new life by asking your guests to save a life. Click the links below, copy the highlighted text, then paste it on to your Facebook page, or add it to your email signature. You can also just click either banner to make a gift donation now.